Inspecting for efficiency, safety, and comfort - one home at a time. Are you preparing to list your home? Pre-inspect your home before you list it, ensuring there are no system defects or issues that could affect the sale of your home. 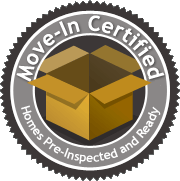 Certifying your home as “Move-in Ready” will make your home stand out from all the others on the market. As both energy costs and environmental awareness rise, energy-efficient "green" homes are becoming more desirable. MoveInCertified.com's Green Certification program can help you enter the market with an edge.